Before you decide to enter a pageant, you have to name your goals and commit to growing regardless of the outcome. Some women end up winning pageants and then are shocked to discover the prize package is rather sparse and the title is more trouble than it’s worth. Once you’ve calculated the true value of the prize package to you at this moment in your life, you’ll be able to make a wiser decision about how to prepare and budget in order to win. You know that there are costs involved in every hobby and career move, pageants are no different. It’s not easy to win a pageant, there is a lot you have to afford, give up, and buckle down on. If you have to remortgage your house and postpone your sister’s heart surgery just to compete in a pageant, you may want to at least make sure the juice is worth the squeeze. 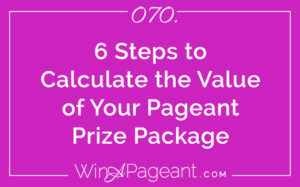 This 6-step Prize Package Calculation process will help you identify how much the pageant is really worth, which will help you to prepare your budget, and help you decide what you’ll give up and where you draw the line. 1. Create a spreadsheet you’ll have 4 columns and several rows. For example, if you are getting a crown and sash, bouquet of flowers, a photography session with a local photographer, a pair of ice skates, and a $500,000 scholarship to a chiropractic school put each one of these in a row in the first column. Obligations are if you have to go to compete at Nationals or be present for a certain appearance. 4. Subtract opportunity cost over 2 years: What will you have to give up? 6. Add the value and subtract the cost. Don’t be fooled: not all pageants bring value. Usually, you get out of it, what you put into it. During your preparation process, when you are crystal clear on how the outcome of this pageant will propel you (versus hold you back), you will be so much more driven to go all in. Plus, when you know the absolute value of a pageant in your life, you’ll be much more confident explaining it to your parents, boyfriend, or boss next time it comes up. getting clear on the vision and it’s application to your own life. Do the work & get educated.